Unfortunately time constraints (i.e my day job) keep getting in the way of me updating this site so all Ive been able to do so far for the Plymouth "Pilgrims" Nickname page is a very basic bit of background. 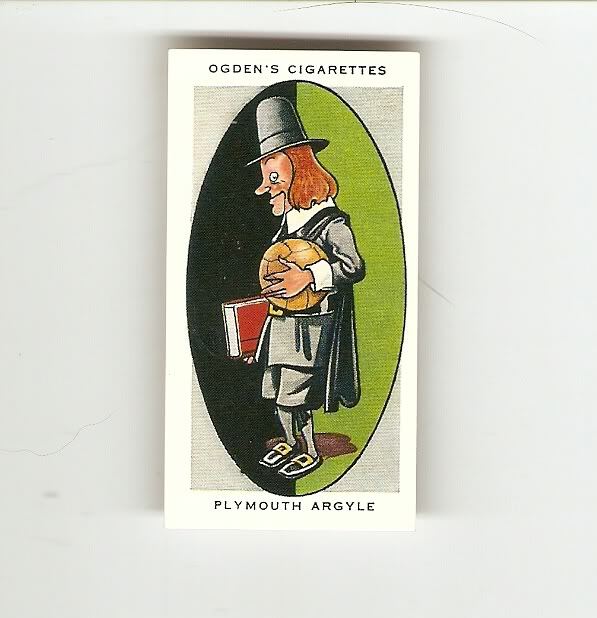 Ive shown below a football cigarette card from the Ogdens AFC Nicknames series that features a Pilgrim with a football which of course depicts Argyles "Pilgrims" nickname !! "The romantic name of the “Pilgrims” was given to Plymouth Argyle because it was from this port that the Pilgrim Fathers set sail. An old Southern League club, the Argyle joined the Third Division on its formation in 1921, and had the unhappy experience of finishing second in six seasons in succession. They achieved their ambition, however, in gaining promotion in 1930, with a record number of points – 68, and have since fully justified themselves as members of the Second Division although the fact that they have more travelling to do than any other club is a big handicap. Mr Robert Jack, father of David, the first £10,000 footballer, is the club manager.". So there you are, a very brief overview of Plymouth Argyles "Pilgrims" nickname, theres a bit to expand on yet though so I will come back to this page shortly.